"Horsetail" redirects here. For other uses, see Horse tail (disambiguation). Equisetum (/ˌɛkwɪˈsiːtəm/; horsetail, snake grass, puzzlegrass) is the only living genus in Equisetaceae, a family of vascular plants that reproduce by spores rather than seeds. Equisetum is a "living fossil", the only living genus of the entire class Equisetopsida, which for over 100 million years was much more diverse and dominated the understory of late Paleozoic forests. Some Equisetopsida were large trees reaching to 30 meters tall. The genus Calamites of the family Calamitaceae, for example, is abundant in coal deposits from the Carboniferous period. The pattern of spacing of nodes in horsetails, wherein those toward the apex of the shoot are increasingly close together, inspired John Napier to invent logarithms. A superficially similar but entirely unrelated flowering plant genus, mare's tail (Hippuris), is occasionally referred to as "horsetail", and adding to confusion, the name mare's tail is sometimes applied to Equisetum. Despite centuries of use in traditional medicine, there is no evidence that Equisetum has any medicinal properties. The name "horsetail", often used for the entire group, arose because the branched species somewhat resemble a horse's tail. Similarly, the scientific name Equisetum is derived from the Latin equus ("horse") + seta ("bristle"). Other names include candock for branching individuals, and snake grass or scouring-rush for unbranched or sparsely branched individuals. The latter name refers to the rush-like appearance of the plants and to the fact that the stems are coated with abrasive silicates, making them useful for scouring (cleaning) metal items such as cooking pots or drinking mugs, particularly those made of tin. In German, the corresponding name is Zinnkraut ("tin-herb"). Rough horsetail E. hyemale is still boiled and then dried in Japan to be used for the final polishing process on woodcraft to produce a smoother finish than any sandpaper. In Spanish-speaking countries, these plants are known as cola de caballo, meaning "horsetail". In these plants the leaves are greatly reduced and usually non-photosynthetic. They contain a single, non-branching vascular trace, which is the defining feature of microphylls. However, it has recently been recognised that horsetail microphylls are probably not ancestral as in Lycopodiophyta (clubmosses and relatives), but rather derived adaptations, evolved by reduction of megaphylls. They are, therefore, sometimes referred to as megaphylls to reflect this homology. The leaves of horsetails are arranged in whorls fused into nodal sheaths. The stems are usually green and photosynthetic, and are distinctive in being hollow, jointed and ridged (with sometimes 3 but usually 6–40 ridges). There may or may not be whorls of branches at the nodes. Microscopic view of rough horsetail, Equisetum hyemale (2-1-0-1-2 is one millimetre with ​1⁄20th graduation). The small white protuberances are accumulated silicates on cells. The spores are borne under sporangiophores in strobili, cone-like structures at the tips of some of the stems. In many species the cone-bearing shoots are unbranched, and in some (e.g. field horsetail, E. arvense) they are non-photosynthetic, produced early in spring. In some other species (e.g. marsh horsetail, E. palustre) they are very similar to sterile shoots, photosynthetic and with whorls of branches. Horsetails are mostly homosporous, though in the field horsetail smaller spores give rise to male prothalli. The spores have four elaters that act as moisture-sensitive springs, assisting spore dispersal through crawling and hopping motions after the sporangia have split open longitudinally. The crude cell extracts of all Equisetum species tested contain mixed-linkage glucan : Xyloglucan endotransglucosylase (MXE) activity. This is a novel enzyme and is not known to occur in any other plants. In addition, the cell walls of all Equisetum species tested contain mixed-linkage glucan (MLG), a polysaccharide which, until recently, was thought to be confined to the Poales. The evolutionary distance between Equisetum and the Poales suggests that each evolved MLG independently. The presence of MXE activity in Equisetum suggests that they have evolved MLG along with some mechanism of cell wall modification. The lack of MXE in the Poales suggests that there it must play some other, currently unknown, role. Due to the correlation between MXE activity and cell age, MXE has been proposed to promote the cessation of cell expansion. The living members of the genus Equisetum are divided into two distinct lineages, which are usually treated as subgenera. The name of the type subgenus, Equisetum, means "horse hair" in Latin, while the name of the other subgenus, Hippochaete, means "horse hair" in Greek. Hybrids are common, but hybridization has only been recorded between members of the same subgenus. While plants of subgenus Equisetum are usually referred to as horsetails, those of subgenus Hippochaete are often called scouring rushes, especially when unbranched. The genus Equisetum as a whole, while concentrated in the non-tropical northern hemisphere, is near-cosmopolitan, being absent only from Antarctica, though they are not known to be native to Australia, New Zealand nor the islands of the Pacific. They are most common in northern North America (Canada and the northernmost United States), where the genus is represented by nine species (arvense, fluviatile, palustre, pratense, sylvaticum, hyemale, laevigatum, scirpoides, and variegatum). Only four (bogotense, giganteum, myriochaetum, and ramosissimum) of the fifteen species are known to be native south of the Equator. They are perennial plants, herbaceous and dying back in winter as most temperate species, or evergreen as most tropical species and the temperate species rough horsetail (E. hyemale), branched horsetail (E. ramosissimum), dwarf horsetail (E. scirpoides) and variegated horsetail (E. variegatum). They typically grow 0.2–1.5 m tall, though the "giant horsetails" are recorded to grow as high as 2.5 m (northern giant horsetail, E. telmateia), 5 m (southern giant horsetail, E. giganteum) or 8 m (Mexican giant horsetail, E. myriochaetum), and allegedly even more. One species, Equisetum fluviatile, is an emergent aquatic, rooted in water with shoots growing into the air. The stalks arise from rhizomes that are deep underground and difficult to dig out. The field horsetail (E. arvense) can be a nuisance weed, readily regrowing from the rhizome after being pulled out. It is unaffected by many herbicides[which?] designed to kill seed plants. However, as E. arvense prefers an acid soil, lime may be used to assist in eradication efforts to bring the soil pH to 7 or 8. Members of the genus have been declared noxious weeds in Australia and in the US state of Oregon. 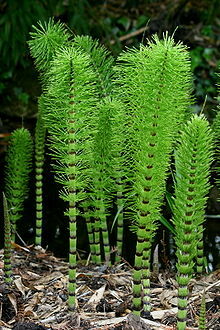 All the Equisetum are classed as "unwanted organisms" in New Zealand and are listed on the National Pest Plant Accord. People have regularly consumed horsetails. The young plants are eaten cooked or raw, but considerable care must be taken. For example, the fertile stems bearing strobili of some species are cooked and eaten like asparagus (a dish called tsukushi) in Japan. Native Americans in the Pacific Northwest eat the young shoots of this plant raw. If eaten over a long enough period of time, some species of horsetail can be poisonous to grazing animals, including horses. The toxicity appears to be due to thiaminase, which can cause thiamin (vitamin B1) deficiency. Extracts and other preparations of E. arvense have served as herbal remedies, with records dating over centuries. In 2009, the European Food Safety Authority concluded there was no evidence for the supposed health effects of E. arvense, such as for invigoration, weight control, skincare, hair health or bone health. As of 2018[update], there is insufficient scientific evidence for its effectiveness as a medicine to treat any human condition. E. arvense contains thiaminase, which metabolizes the B vitamin, thiamine, potentially causing thiamine deficiency and associated liver damage, if taken chronically. Horsetail might produce a diuretic effect. Further, its safety for oral consumption has not been sufficiently evaluated and it may be toxic, especially to children and pregnant women. ^ "Equisetum thermale sp. nov. (Equisetales) from the Jurassic San Agustín hot spring deposit, Patagonia: anatomy, paleoecology, and inferred paleoecophysiology". American Journal of Botany. 98 (4): 680–97. April 2011. doi:10.3732/ajb.1000211. PMID 21613167. ^ "An Introduction to the Genus Equisetum and the Class Sphenopsida as a whole". Florida International University. Archived from the original on 2009-07-14. Retrieved 2009-07-22. ^ Sacks, Oliver (August 2011). "Field Trip: Hunting Horsetails". The New Yorker. ^ Daniel F. Austin (2004). Florida Ethnobotany (illustrated ed.). CRC Press. p. 283. ISBN 9780203491881. ^ Rutishauser, R (November 1999). "Polymerous leaf whorls in vascular plants: Developmental morphology and fuzziness of organ identities". International Journal of Plant Sciences. 160 (S6): S81–S103. doi:10.1086/314221. PMID 10572024. ^ "Horsetail plant spores use 'legs' to walk and jump – BBC News". BBC News. Retrieved 2015-11-30. ^ Fry, S. C.; Mohler, K. E.; Nesselrode, B. H. W. A.; Frankov, L. (2008). "Mixed-linkage -glucan:xyloglucan endotransglucosylase, a novel wall-remodelling enzyme from Equisetum (horsetails) and charophytic algae". The Plant Journal. 55 (2): 240–252. doi:10.1111/j.1365-313X.2008.03504.x. PMID 18397375. ^ Fry, Stephen C.; Nesselrode, Bertram H. W. A.; Miller, Janice G.; Mewburn, Ben R. (2008). "Mixed-linkage (1→3,1→4)-β-d-glucan is a major hemicellulose of Equisetum (horsetail) cell walls". New Phytologist. 179 (1): 104–15. doi:10.1111/j.1469-8137.2008.02435.x. PMID 18393951. ^ Sørensen, Iben; Pettolino, Filomena A.; Wilson, Sarah M.; Doblin, Monika S.; Johansen, Bo; Bacic, Antony; Willats, William G. T. (2008). "Mixed-linkage (1→3),(1→4)-β-d-glucan is not unique to the Poales and is an abundant component of Equisetum arvense cell walls". The Plant Journal. 54 (3): 510–21. doi:10.1111/j.1365-313X.2008.03453.x. PMID 18284587. ^ Pigott, Anthony (4 October 2001). "Summary of Equisetum Taxonomy". National Collection of Equisetum. Archived from the original on 21 October 2012. Retrieved 17 June 2013. ^ Kress, Henriette, Getting rid of horsetail, Henriette's Herbal Homepage, April 7th, 2005. Retrieved May 19, 2010. ^ William Thomas Parsons; Eric George Cuthbertson (2001). Noxious weeds of Australia. CSIRO Publishing. p. 14. ISBN 978-0-643-06514-7. ^ "Equisetum telmateia Ehrh. giant horsetail". USDA. Retrieved 2010-05-18. ^ a b c d e f g "Horsetail". Drugs.com. 11 June 2018. Retrieved 19 August 2018. ^ Michael Ashkenazi, Jeanne Jacob. 2003. Food culture in Japan. Greenwood Publishing Group. 232 p.
^ Plants For A Future Database. ^ Erna Gunther. 1973. Ethnobotany of western Washington: The knowledge and use of indigenous plants by Native Americans. ^ a b c d "Horsetail". MedlinePlus, US National Library of Medicine, National Institutes of Health. 8 December 2017. Retrieved 14 November 2013. ^ Henderson JA, Evans EV, McIntosh RA (June 1952). "The antithiamine action of Equisetum". Journal of the American Veterinary Medical Association. 120 (903): 375–8. PMID 14927511. ^ Fabre, B; Geay, B.; Beaufils, P. (1993). "Thiaminase activity in Equisetum arvense and its extracts". Plant Med Phytother. 26: 190–7. ^ a b Dragos, D; Gilca, M; Gaman, L; Vlad, A; Iosif, L; Stoian, I; Lupescu, O (2017). "Phytomedicine in Joint Disorders". Nutrients. 9 (1): 70. doi:10.3390/nu9010070. PMC 5295114. ^ a b "Scientific opinion on the substantiation of health claims related to Equisetum arvense L. and invigoration of the body (ID 2437), maintenance of skin (ID 2438), maintenance of hair (ID 2438), maintenance of bone (ID 2439), and maintenance or achievement of a normal body weight (ID 2783) pursuant to Article 13 of Regulation (EC) No 1924/2006". EFSA Journal. European Food Safety Authority. 7 (10): 1289. 2009. doi:10.2903/j.efsa.2009.1289. Retrieved 2013-10-09. "Horsetail" . Encyclopædia Britannica (11th ed.). 1911. Wikimedia Commons has media related to Equisetaceae. This page was last edited on 22 March 2019, at 11:34 (UTC).